A meeting of the Town Council (Precept). Everyone's Health Pop up Shop at 6 Chequers Court, Huntingdon from Monday 14th January 2019 - Friday 22nd February 2019. 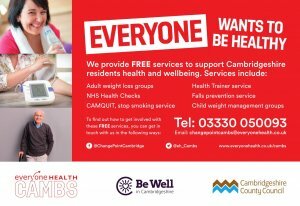 Adult weight loss groups, NHS health checks, CAMQUIT stop smoking service, Health Trainer service, falls prevention service, child weight management groups. Falling in Love With Reading is a free course for parents & carers of children aged from 3 to 7 years old who are interested in discovering a love of reading. Join us for lots of fun on Saturday the 19th & 26th of January 10:30-12 pm at Huntingdon Library. An extraordinary meeting of the Town Council. A meeting of the Leisure & Community Services Committee, to follow after the Extraordinary Town Council Meeting. Approximately 7.30pm. A meeting of the Planning Committee, to follow after the Leisure and Community Services Committee. Approximately 8.30pm. Baby Clothes Swap at Huntingdon Library on Friday 25th January 2019 from 10.00am - 12noon. Free entry, buy a bag of clothes for £1. Come along to the popular baby clothes swap event at Huntingdon Library! Donate you unwanted baby clothes (aged 0-2) and swap for new clothes for free. Or if you don't have any clothes to donate please come along on the day and buy a bag for just £1. All clothing left at the end of the day will be donated to a charity shop. Digital Art and Creative Ageing at Huntingdon Library on Friday 25th January 2019 from 10.30am - 12.30noon. 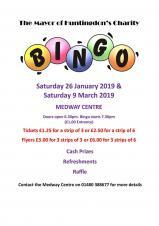 Free event (donations welcome). Booking required, please contact library staff or call 0345 0455225 for a ticket. Are you 50? Would you like to create art on a tablet? Work with digital artist Jason Wilsher-Mills and discover what you and a tablet can do. There will be 2 sessions at Huntingdon Library, the first on Friday 25th January 2019 and Friday 1st February 2019. Come to one event or both. Kindly supported by Arts Council England, part of the Library Presents programme. Both former winners of international prizes, Katya and Charles have separately distinguished themselves as soloists and ensemble players of the very highest quality. Here they will join forces to create an unusual and exciting duo team on one piano. Each has independently carved out an exceptionally distinguished solo career worldwide but will tonight entertain with a duet programme including works by Schubert, Schumann and Brahms. Back to basics card craft creating simple beautiful cards. Craft it Yourself, 16 St Benedict's Court, Huntingdon. No experience necessary as full tuition and materials to complete the class will be provided. If you have them, please bring basic tool kit of scissors, bone folder and a variety of your chosen adhesives with you. A limited supply will be available. Light refreshments will be offered throughout. Pricing options: option one free with a qualifying order of £20 or more, placed during the class or a £12 for the class only. 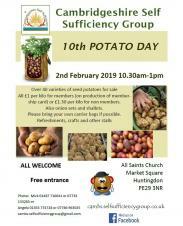 Over 40 varieties of seed potatoes for sale. All £1 per kilo for members (on production of membership card) or £1.30 per kilo for non members. Also onion sets and shallots. Please bring your own carrier bags if possible. Refreshment, crafts and other stalls. HTML5 validated. WCAG compliant. Page generated in 0.1543 seconds.